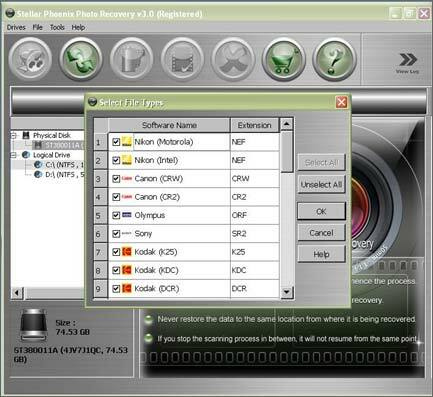 Recover photo images, music and movies files from all storage media, hard drives and logical drives. Stellar Phoenix Photo Recovery Software to recover lost, deleted and formatted digital pictures, music files on removable media, after an accidental deletion, media format or corrupt media. Phoenix Photo Recovery Software works with any type of digital card reader or storage media that appears as a drive letter in your local PC. Qweas is providing links to Stellar Phoenix Photo Recovery 3.0 as a courtesy, and makes no representations regarding Stellar Phoenix Photo Recovery or any other applications or any information related thereto. Any questions, complaints or claims regarding this application Stellar Phoenix Photo Recovery 3.0 must be directed to the appropriate software vendor. You may click the publisher link of Stellar Phoenix Photo Recovery on the top of this page to get more details about the vendor.